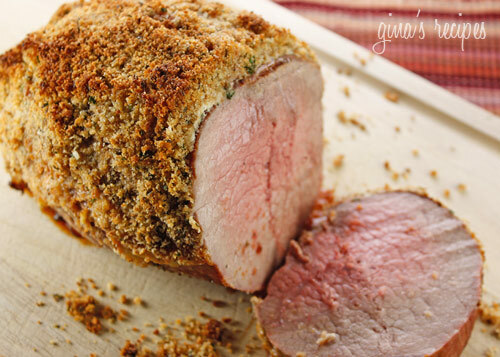 The combination of sour cream, horseradish, herbs, garlic and breadcrumbs make this a fabulous roast. 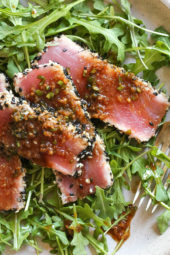 Simple enough to make as a weeknight dinner served with vegetables or elegant enough to serve for a special occasion. I found this recipe in an old Everyday Food magazine and modified it to make it lighter. I will definitely be making this again when I am craving beef. I had this with a salad and fresh vegetables to keep the points down. In a small bowl combine sour cream, salt, pepper and horseradish. In another bowl combine breadcrumbs, herbs, garlic and oil. Season meat with salt and pepper. Sear roast in a large skillet on high heat for about 10 minutes total on all sides. Place in roasting pan and cover with sour cream and breadcrumbs on top of roast. Place in the oven and cook until thermometer reads 140°, about 35 to 40 minutes. Remove and let it rest for 15 minutes before slicing. Serves 8. Did you let the roast come to room temp first? Thanks. I made this tonight. OMG – so good! I used gluten free bread crumbs as ny sin has celiac and used fat free Greek yogurt instead of sour cream. I had a roast in the freezer – not exactly sure of the cut, but it had no fat. I cooked in a covered roasting pan. Tender, flavorful and a huge hit in my house. Planning on doing this roast tonight for supper but was wondering do I uncover the roasting pan near the end, leave it covered or do I cover it at all…. 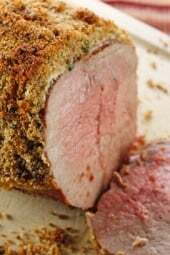 I have done a crusted roast in the past that I do uncovered but at a lower temperature.. It says 5 servings, but then at the bottoms says serves 8. Which one is correct? I am hoping to make this for holidays and want to make sure I have enough to feed everyone. I think it is 8 I have made this the past 2 Christmases and I feed about 45 people. But i used 2 huge roasts. I quadruple the crust recipe and cook based on total weight…It is a hit and they ask me to make it every year! This might seem silly but when you say sear on all sides for 10 minutes do you mean 10 minutes on each side (for a total of 40) or 10 minutes total? I made this the other night with Pork Chops and it was EXCELLENT!!!!!! Definetly a keeper and will make again as it was so easy and tasty! This looks delish! One question…it says 5 servings but then at the bottom of your recipe it says serves 8. I was just wondering which was correct. Thanks. Gina, is there something different besides sour cream that can be used to keep the breadcrumbs sticking to the meat while cooking? I was thinking maybe spicy mustard or creamed spinach but I've never prepared or eaten rib eye so I don't know how it would taste. 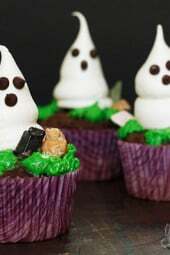 I'd love to make this for my parents tomorrow night! I made it using a sirloin tip roast (it was what I had on hand) and it was fabulous. I'm making this tonight, but subbing fat free Greek yogurt for the sour cream. Thank goodness eye of round roast was on special at whole foods! It's the same for both. Is this using the old WW points or new? @wings, I hope you don't find a bad one! Thanks for your comment, enjoy your salad! But oh my… Oh my Oh my Oh my! Gina, another fantastic hit! We made this last night with Crash Hot Potatoes and a side of green beans & mushrooms. Perfect, wonderful meal with plenty of delicious leftovers (I'm anxious for lunch today!). I'm still waiting to taste ANYTHING bad from your site. I've decided that day just isn't coming. Tonight is your Grilled Chicken & Spinach Salad w/Balsamic Vinaigrette, and I expect the chicken will make for some yummy chicken salad for lunch tomorrow. Thanks Gina… you're rocking my dinner table almost daily! Oh my goodness…I made this for dinner tonight and it was so incredibly delicious! It tasted amazing, but I also loved that it felt like something really special and hard to make but it couldn't have been easier to do! I am keeping this recipe at the top of my list for any dinner parties coming up. I definitely recommend this recipe! Sirloin tip would be great. Hi Gina, just found your excellent website. Will be sharing at the next WW meetings. For the above, would you suggest that a sirloin tip roast could be used instead or do you recommend the rib eye? Thanks! 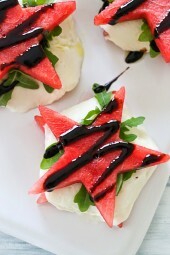 I plan to make this for a dinner party this weekend. So I just wanted to let you know I made this the other night with a few modifications, I made a parsley pesto to cover the roast and I used a pork roast instead. I browned all sides of the roast like you did and then in a food processor I mixed parsley, garlic, olive oil, salt, pepper and a little parm. cheese. This was so good, served the roast with spinach and mushroom risotto and broccoli. Yum!!! Is that so? Guess it was mislabeled! This recipe works for any type of roast. I think that is an eye of round. Ribeye would be a significantly more fatty piece of meat and way more calories. But it looks very good! @Hannah, it's probably good with pork, just make sure you cook the pork well. @Mysti- maybe just leave it out and some fresh herbs like thyme to the sour cream instead? I've been experimenting with some new recipes, but if I don't love them, I don't publish them so if you don't see a recipe for a few days, chances are I'm working on it. Thanks for spreading the word! Hi Gina, is there any other spices that can be substituted for the horseradish? I can't stand that stuff but really want to make this recipe for a family get together Super Bowl weekend. Ideas? Again, thanks for all the work you do with this site. I just love it and tell all my co-workers/family about it! My parents have also made the Crock Pot Santa Fe Chicken, with rave reviews! Please keep the recipes coming!!! Do you think this can be made with a pork roast instead of a Rib eye roast? That looks so good! What a beautiful photo! I just found your blog and I'm in LOVE!!! I can't wait to try these delicious sounding recipes!!! Looks just beautiful! I'm sure we'd all enjoy that here. Oh my goodness this sounds fantastic! I MUST try it!